Can anyone tell me what should be checked on my startup menu? Thanks. 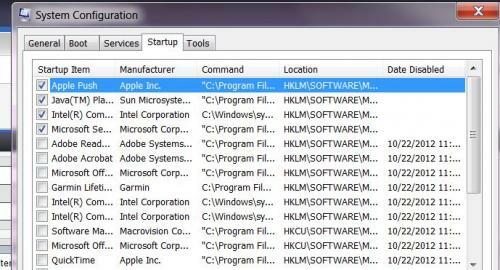 Hi PattiChati, A lot of software may have settings from within the software itself. For example: start with Windows, check for updates etc. If you click a icon by the clock to bring up the software you could look under; settings, preferences, options etc. This would be one way to help control things and I would look there first. Of course not everything drops a icon in the system tray. Windows MSCONFIG provides more control. I believe in Windows 7 it would be safe to disable any item under the start up tab, as essential services run under the Service tab and these should be left alone. Looks like you have most disabled. Beware that disabling a start up entry may increase the start up time of software when you want to use it. For example your Kodak tools may take longer to start up when you want to use them since its not running in the background any more. Some of these also might be .exe that check for updates, something you could do manually. That Java entry I would leave checked in case its a update checker. You want Java to stay updated if thats what it is. I would guess the Apple Push has to do with Itunes or a phone. 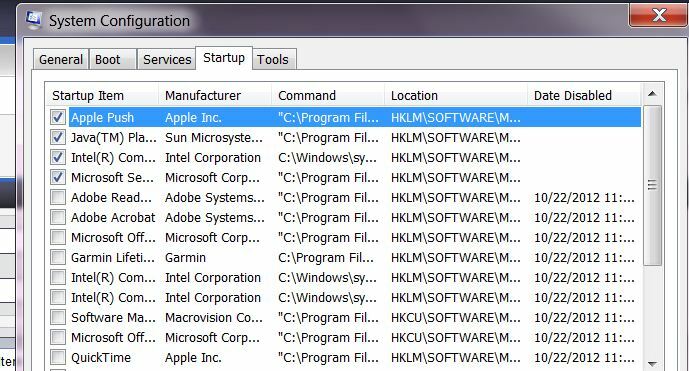 The intel and MS entry cant really tell unless you provide more details to the path of the .exe.